Featured Version: Nintendo SNES First Day Score: ??? Despite playing the crap out of my SNES in my younger years I never really had that many games for it. One of the classics I kept meaning to get around to playing at the time, and in the intervening years as well, was Pilotwings but for one reason or another I didn't actually manage it until recently. Better late than never, I usually think in these cases, but I wasn't so sure here. Pilotwings was after all a flag-waving advert for the SNES's famed Mode 7, an early attempt at producing 3D graphics on home systems, and most early attempts at anything in games don't tend to age very well. Then again, F-Zero still kicks arse so hope remains while the company is good. It's also a game notable for it's almost total lack of violence. Okay, you can crash stuff but you can't shoot and certainly can't kill anything, with your objectives simply being to fly stuff well. 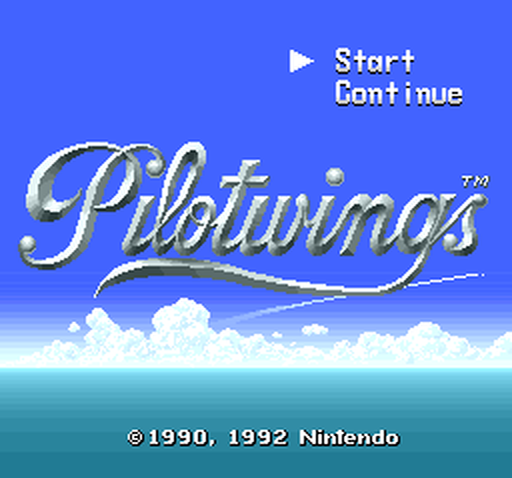 I guess that makes Pilotwings a simulation game, albeit in a unashamedly arcadey way. It was a bit of a rare and precious gem all round for console gamers then. Heading for the landing zone, but which one do I go for? It doesn't even have a back-story really. I suppose it was more intended as a tech demo than anything else; something to make owners of other systems see what they'd be missing out on if they didn't snaffle a SNES at the accompanying launch. It did its job well too - the game duly wowed onlookers and earned much praise from magazines of the day, but were they just dazzled by its revolutionary graphical tricks or is it actually a good, well made game? That's what I've wondered for many years of men but I had a feeling it would still offer many humorous tomfooleries. After all, who wouldn't enjoy arsing around in various flying vehicles? That's pretty much all Pilotwings is too, with the game consisting of a series of lessons in a variety of craft which take place within a series of arenas. There are eight lessons in total and your ultimate objective is to perform well enough to gain membership of Flight Club, presumably an exclusive playground for snobby fly-boys. The first lesson gives you a choice of two events - light aircraft and skydiving - with different options coming in later lessons. You get points based on your performance during each event and the lesson has a score target which you must meet in order to advance. Points are scored based on accuracy and the time taken to complete the objectives which usually involve flying through certain targets such as rings or hitting a designated landing zone/target. 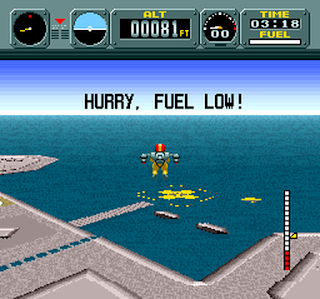 Later events introduce a rocket belt (jet-pack) and hang-glider too, which brings the number of different events to four. This is a bit less than I thought there was to be honest but never mind, it won't matter too much as long as they are enjoyable to play. 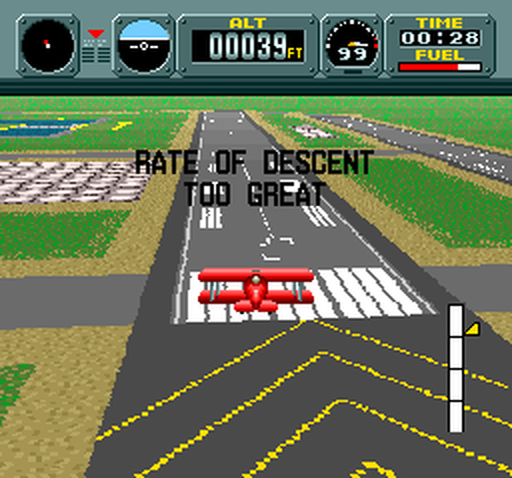 Of course, in a simulation game, even a simple one like this, that depends very much on one thing. No, it's not the flashy faux-3D graphics. They may look pretty but they're not much use without precise and intuitive controls, and I was interested to see if the humble SNES pad would be sufficient. Each type of craft has very simple controls as you might expect, with one or two buttons providing the power or performing actions (like opening your parachute in the sky diving) while the d-pad steers, and in this simple arcadey way the now iconic controller is fine. Obviously it takes a few tries with each craft to get used to it and they can still be tricky even then. 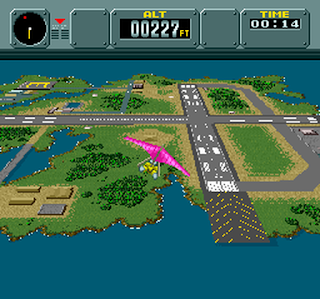 I'm a bit crap with the hang-glider, for example, as you have to rely on thermals to gain height, but there's nothing super tough to ruin the rest of the game. I think my favourite is the light aircraft - there's something relaxing about chugging around in an old biplane, drifting through rings here and there - but they're all pretty good fun to mess around with. 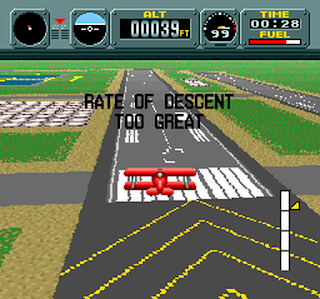 Of course, whether you want to do this or take things more seriously to improve your scores, the graphics are still nearly as important as the controls. 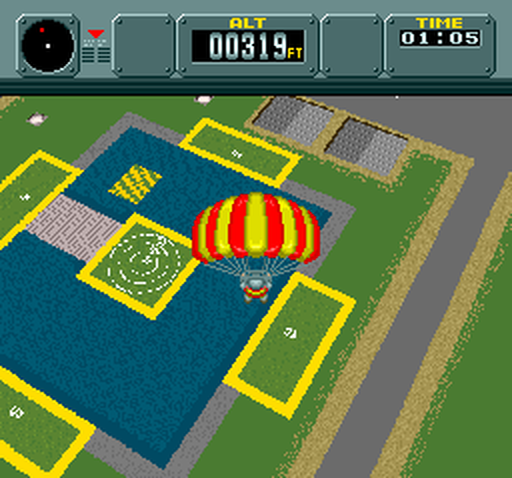 They were, after all, the main reason for the game's fame - screenshots alone had many gamers drooling but any who actually saw the game running were desperate to play it. But how do they stand up today? Quick, we can make it! Well, as with most Mode 7 games, the scaling is very jerky and pixelly by today's standards, and the landscapes are all totally flat, but it's still easy to see how impressive it was in its day. The distant islands that make up the game's stages look great as they gradually get closer and closer, whether from a vertical or horizontal axis, and the sense of scale is also well portrayed. Of course, the novelty does wear off eventually and I'm less sure the game itself holds a huge amount of long-term appeal. It's shouldn't take too much effort to get perfect scores on most of the stages, and once you've done that you'll most likely return only on the odd occasion. That said, it's still a game that makes a big first impression and is tremendous fun while it lasts. The music is quiet but suits the (mostly) calm action well, there are cool hidden bonus stages to find, and those graphics remain effective as well as impressive all these years later. Not even the faster and more exciting F-Zero made such good use of the SNES's Mode 7 abilities. It might not last long but it's still well worth a play-through. Gameplay Video: here's a video of the whole game being played by one of the talented fellows at World of Longplays (check out their great channel here). Oh, and don't watch if you want to avoid spoilers! I have the NTSC-J version of this game (sadly without the box). As always you post the the best from the best with writing skill of highest level.